This information about the Grotto was published in the Auckland Regional Council Big Clean Up newsletter in December 2007. It’s affectionately known to locals as ‘the grotto’: a green hectare of land in Onehunga formed when a lava lake from the Mt Smart eruption collapsed. The site, which looks like a crater with volcanic rock sides, was once occupied by Onehunga Laboratories Limited, which used the diatomaceous earth to manufacture mild abrasives called ‘Grotto Maid’ and ‘Denture Glow’. During the Second World War the crater was also used to grow crops of tobacco and to house and breed Peking ducks. 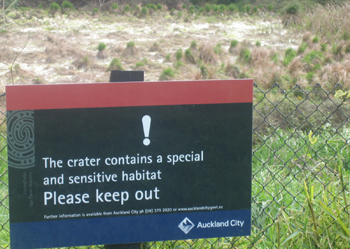 The crater also contains a very rare NZ carex, or grass. Plans are underway to remove all the invasive exotic plant species and replant with suitable natives. The Grotto was also featured in Volume 58 (2) December 2003 edition of the Auckland Botanical Society Journal. 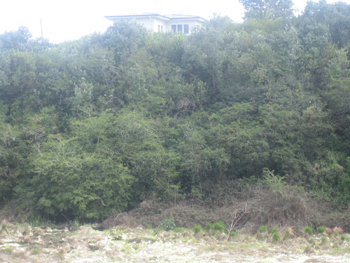 An article on “The Flora of “The Grotto”: a volcanic collapse pit on the lower slopes of Onehunga, Auckland” was written by Timothy J Martin.